Chopping down wood to build fires, carrying water from the stream and playing games in the wild are just some of the things cave kids do regularly. 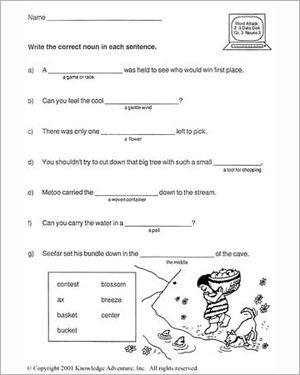 Read the sentences in this English worksheet to learn more about the different things cave kids spend their time doing. Some of the nouns are missing from the sentences, so you’ll have to complete the sentences first. The word meanings below each blank will help you figure out which noun goes where. For more practice with these words, look for the other third grade worksheets in this set, “Woolly and the Cave Kids”.